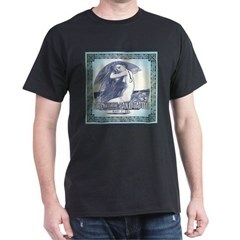 Here they are--I bought the high resolution pix of the Girl With the Banjo Tattoo CD cover, and Cafe Press is printing them on high quality T-shirts. (They printed the Florida Banjo T-shirts too and I've been wearing one for 3 years--and it still looks new and the colors are great. :) Here's the link to Cafe Press--you order directly from them. Picking T-shirts, hats, bag, and more ! Florida Banjo Design with old time clawhammer banjo and Florida fruit label style design with oranges. Colorful and practical gear & gifts for the banjo picker .